I read on your website of your plans to do a study of World Geography and Cultures this year using the OurLosBanos materials as a guide. I see that they are referring users to a WinterPromise that will be out this fall. Then I saw your post here where you mentioned using Around the World in 180 Days as a guide and adding in other materials. We’ve been doing chronological studies for quite a while. I’m praying about changing the pace this year and do something different. I’m wondering if you wouldn’t mind sharing a few more details of how you plan to flesh out your plans. Many of the resources below are ones that were suggested in the Los Banos plans so I will give a huge *thank you* to Jennifer at GuestHollow for all her hard work in originally putting the framework in place. I combined her work with the Trail Guide to World Geography with a few extras to make this course happen for our family. Please feel free to use and adapt for your family. I suggest that if you want to offer a similar course to your high school students that you will need to sit down and develop a list of goals you are reaching for during your year. As for our goals? We want our boys to be confident about where things are in the world (generally if not specifically), but more than that we want them to feel the smallness of the world, know a little about the needs of other cultures as it relates to our faith, and a whole lot of the flavor and variety that people come in that live in other countries. We don’t want them to only learn about history and culture from our own very small town point of view. They need to know how this system of things that we live in works and how they can move about in the world. Those are lofty goals that will more than likely not be all achieved in one World Geography course. I made a Listmania list on Amazon.com for your convenience in viewing the bulk of the materials we are using this year for high school World Geography. In the list below, I have included much more than the resources listed on Amazon.com. As noted in several sections, I will post separate entries to explain items further. I also do not know how closely this plan follows any one sort of homeschooling philosophy …probably closer to project based learning than anything else or perhaps even a huge unit study. Most of the follow-up activities that are going to be offered are totally self-directed and could be considered various forms of narration: written narration, oral narration, commonplace books, map completion. There is also very slow reading of books, lots of free time to explore using a variety of materials, and lots of discussion as a family. 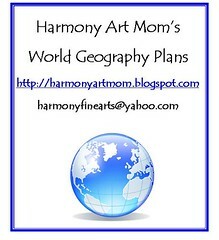 We will call it Harmony Art Mom’s Eclectic Style World Geography And Culture. Giant Wall Map: Thanks to my husband we were able to frame this map that we purchased from Amazon.com and make into a work of art in our living room. It has been up on the wall for almost a year now and we all have gained a better idea of the world’s geography from just browsing the map at our leisure. The map is very inexpensive and he made a frame for it. 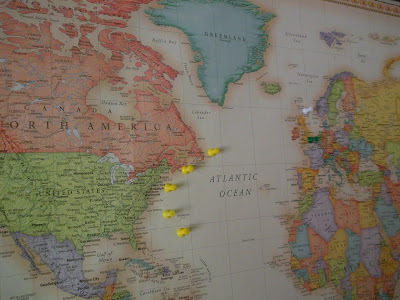 He mounted the map using spray adhesive onto a piece of foam insulation board that he purchased at Home Depot. I think the whole project cost about $30.00. Edit to add: We are now enjoying using Wondermaps from Bright Ideas Press. This excellent product is a great tool for making your own customized maps. I love it so much I am now an affiliate for Wondermaps. I am finding that these are skills that the boys are honing using this curricula. They are learning more than geography by researching about each place in their weekly assignments. I am using the plans as a framework and requiring some memorization of countries and capitals that we frequently hear about in the news. Don’t be fooled by the simpleness of these plans. As part of the Trail Guide World Geography plans, there is a complete literature unit using Around the World in Eighty Days. We also are using the Answer Atlas as suggested in the plans for the Trail Guide. There are two more resources that I have on the shelf to use as we feel like the need is there. Geography through Art and Eat Your Way Around the World are excellent resources for all ages. There is also a Student Notebook for High School level that you can purchase and it includes all the printables for you to use with this program. Notebook pages include animals, habitats, gems, plants, and more. History Scribe: The World-Learn All About the Countries of the World: We are using these notebook pages to enhance our study. The boys like having a place to organize their research and it gives them a concrete written narration at the end of the week to share at our meeting. Geography Coloring Book: For weeks that we are studying a country that is not included in Trail Guide World Geography, I have assigned maps from this sophisticated coloring book for the boys. They will be using the detailed instructions to complete the maps which look like works of art when they are completed. Leapfrog Explorer Globe: I am listing this globe with reservations. Although it is a great learning tool, I think it is overpriced. I was able to purchase mine at half price last year and I would never have purchased it at full price. After saying that, I have to tell you that *every* member of our family enjoys this globe from youngest to oldest. My children have even taken it to family gatherings to share. 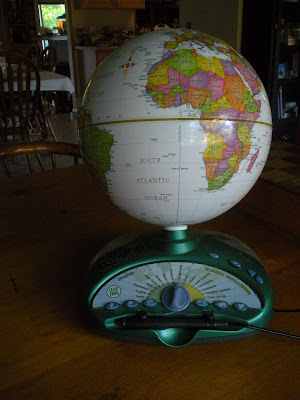 I was amazed that so many of our family members had a blast with this globe. 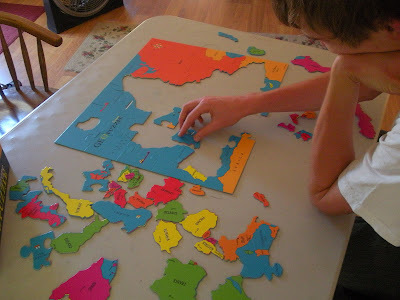 It is not only fun but it challenges you to learn more about geography. We play the challenge games against each other or we play as teams. This might be a great thing to put on a wishlist. We have found these to be a wonderful resource so far. On the left side of the page, click on countries and there are many to choose from. Please preview any videos you think you might like to share with your children. Netflix: We are using Netflix as a source of travel DVDs and other movies about various world cultures. I will post a list in a separate blog entry soon. National Geographic Magazine: Yes, I have gone ahead and subscribed for the next year to this magazine. There are things presented that I have issues with about evolution and such but as far as providing glimpses into other cultures and making things seem more real….this is a visual feast and my boys…all three including my oldest twenty-two year old….grab this as soon as it comes and devour it. Besides, we will use these as sources of maps and images for years to come. Free Reading Books: We are using various literature books from around the world to enhance our study of geography. I will post a separate list of books in another entry. I think that covers the big stuff for our study. I am really just providing my sons with a framework and they are filling in the gaps with their own ideas. The best part about the plans that we have for learning about the modern world is that it is flexible and roomy enough to veer off the plan but still be on track. So many of the resources don’t feel like schoolwork. The giant wall map has become part of our everyday life. 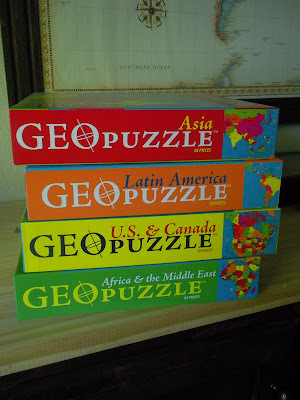 The puzzles and the globe are used all during the week as the interest comes up. The Netflix DVDs are family viewing since we do not have regular television or satellite anymore. Friday and Saturday night movie night is already a well established routine and now we are just mixing in a few of the titles from our geography plans. So far, no complaints. I already explained that the boys enjoy reading the National Geographic magazine and it has become a source of great dinner converstation about trivia and interesting facts they glean from the pages. The boys use Google Earth all the time now as something comes up in converstation. If during their current event they come across something that they can look up, they fire up Google Earth and share what they find. (This week alone we have looked at Guantanamo Bay, Hurricane Bill’s path, and Baghdad.) This really doesn’t feel like schoolwork but the boys are gaining such a grasp of how our world truly is connected now more than ever. I am hoping to keep you updated as we work through the year. We have a lot of work ahead of us, but I can see how this is enriching our life already. I love it when we are all excited and upbeat about a project. This is how we are viewing this more than anything…a family project. Let me know what you think or if you know of any more resources out there. Shared this on Jen’s Friday FreeBEE. ← Drawing With Children-At What Age? We chose to d/c our tv service a few months ago too, and began using Netflix for movies (for family nights, movie nights, etc) — we love all of the variety – art, music, drama, shakespeare, opera, symphony, how-to’s, history, geography, tours of places, recordings of peoples, re=enactments of various events – but we esp their history selections. This small change has eliminated so many distractions for our family, and also cut greatly the “world” influence on all of us. The changes to our hearts have been remarkable — and the knowledge gained from “good” programming has been fantastic too ! I recommend it highly !! We have had Netflix for about three years and I cannot recommend it highly enough. I should write a whole post just on how we have used it for history, Spanish, literature follow up, science, and so much more!!! We made the decision to cancel our satellite for financial reasons and because we honestly did not watch that much television to begin with. I have enjoyed the lack of twaddle and the lack of worldly cultural exposure so much. More time for more wholesome fun. We took up volleyball as a family this summer and the boys practice in the evening hours now. Wahoo! Hello! Thank you for this wonderful post. I am going to print it and put it in my “high-school ideas” notebook. I love what your husband did with your world map. I am pretty sure I have the exact same map. It is hanging in the hall but I love the idea of having it on foam board so that pins can be easily stuck into it, and if we didn’t hang it – it could move from place to place. How do you use the push pins? Do you mark each country you study? Thanks again for a great post. Also – we love Netflix – great educational resource! Just found your blog, am a brand new homeschooling mom w/ a 2 and 4 year old. Just wanted to recommend Smithsonian magazine. Great articles on anything and everything. I love learning and love this magazine – I think you can read a lot of the articles online to check it out. Thanks for putting all your resources and ideas out there for us to glean off of! Hi there. I am very new to your blog. I have a 17 year old son that has been homeschooled for going on 4 years. It has been the best years of his life! I look forward to reading more of your blog. 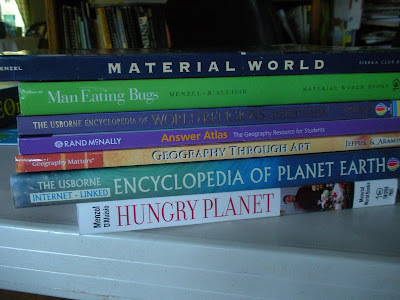 I and others over at the WTM website have been talking about your lovely geography materials for providing a living books approach to a high school level geography study. I either own or have access to most of the books you mention and I’m wondering if you had a plan for implementation of work for the year when you did this, or if you just did a little of this and a little of that? I’m trying to decide how I will schedule this for the year…. I do have it all planned out on paper which I don’t mind sharing but it will take a little while to gather it up in a usable format. I loosely followed the Trail Guide sequence but we added in a lot of extra countries when we found things that matched our interests and current events. Could I put it on my list of things to do and let you know when I get it done? Wow! Thanks so much for putting this together! We have used your free world geography course this year and LOVE it!! Thank you so much for taking the time to put it together and share your plans. Thanks Alex. We had a wonderful year of geography using the plans and I am so glad you found them useful too. I’ve just been browsing these and continue to be thankful for all you do for us. These are fabulous! We’ve been doing several hands on geography projects the last couple of weeks – salt dough map and paper mache globe. Lots of painting! All our ages have been having a great time. But I was wanting my older ones to do a more in-depth study. Hooray for you!